Download "EXPERIENCE ST. LOUIS UNIVERSITY SCHOOL OF LAW,"
1 MATTHEW T. BODIE Hofstra University School of Law St. Louis University School of Law 121 Hofstra University 3700 Lindell Boulevard Hempstead, New York St. Louis, Missouri (516) (314) EXPERIENCE ST. LOUIS UNIVERSITY SCHOOL OF LAW, St. Louis, Missouri, 2006 to present Associate Professor, beginning fall Visiting Associate Professor, Courses: Contracts (I & II), Corporate Governance seminar, and Employment Law. HOFSTRA UNIVERSITY SCHOOL OF LAW, Hempstead, New York, 2002 to 2007 Associate Professor. Courses: Business Organizations, Contracts (I & II), Corporate Governance seminar, and Employment Law. 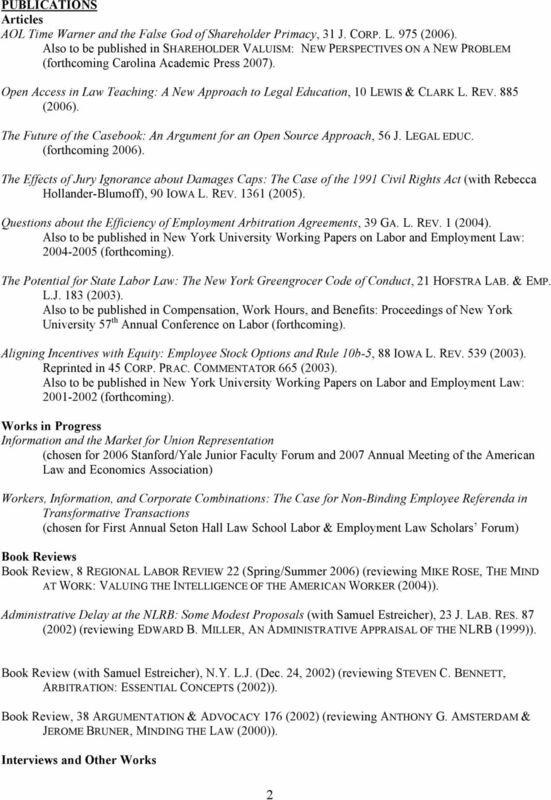 Chair, Faculty Advisory Board, Hofstra Labor and Employment Law Journal ( ). Co-auctioneer, 2005 Public Justice Foundation Public Interest Auction. Member, Entry-level faculty appointments committee ( ). Member, Child & Family Advocacy Fellows selection committee (2004). 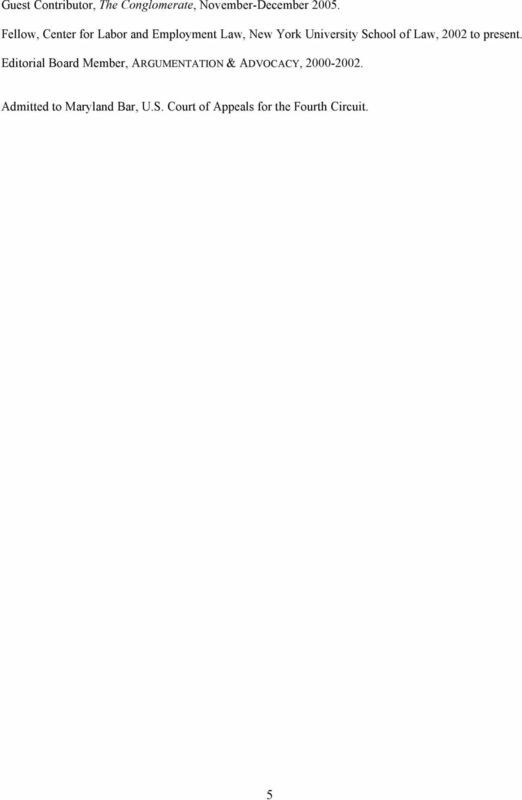 Member, Curriculum committee ( ). 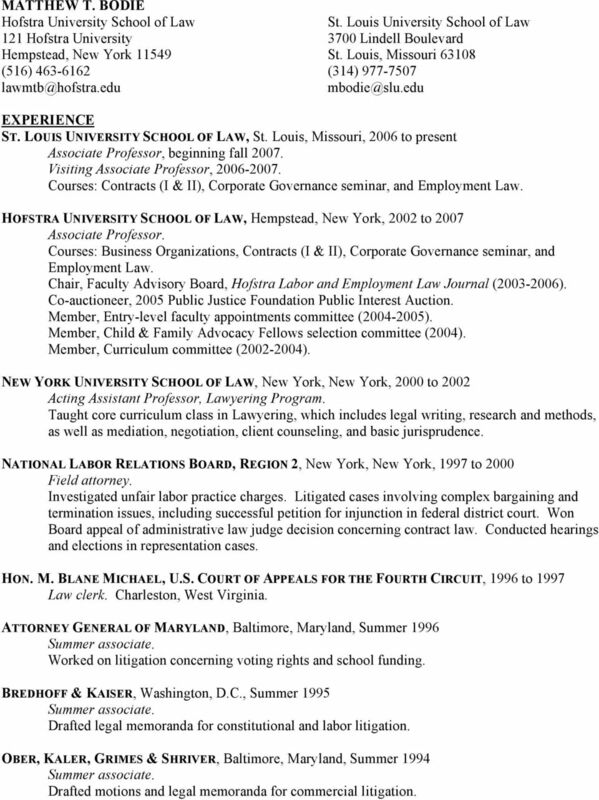 NEW YORK UNIVERSITY SCHOOL OF LAW, New York, New York, 2000 to 2002 Acting Assistant Professor, Lawyering Program. Taught core curriculum class in Lawyering, which includes legal writing, research and methods, as well as mediation, negotiation, client counseling, and basic jurisprudence. 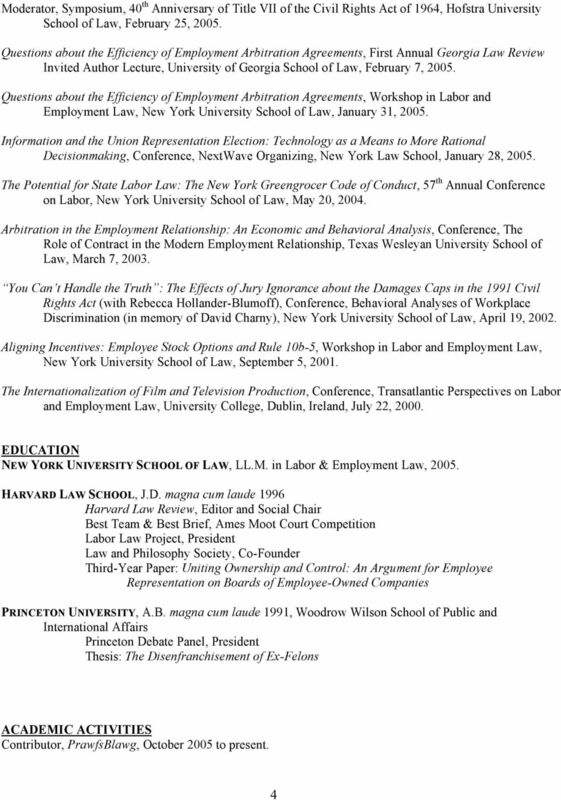 NATIONAL LABOR RELATIONS BOARD, REGION 2, New York, New York, 1997 to 2000 Field attorney. Investigated unfair labor practice charges. Litigated cases involving complex bargaining and termination issues, including successful petition for injunction in federal district court. Won Board appeal of administrative law judge decision concerning contract law. Conducted hearings and elections in representation cases. HON. M. BLANE MICHAEL, U.S. COURT OF APPEALS FOR THE FOURTH CIRCUIT, 1996 to 1997 Law clerk. Charleston, West Virginia. ATTORNEY GENERAL OF MARYLAND, Baltimore, Maryland, Summer 1996 Worked on litigation concerning voting rights and school funding. BREDHOFF & KAISER, Washington, D.C., Summer 1995 Drafted legal memoranda for constitutional and labor litigation. OBER, KALER, GRIMES & SHRIVER, Baltimore, Maryland, Summer 1994 Drafted motions and legal memoranda for commercial litigation. Discrimination in Baby Making: The Unconstitutional Treatment of Prospective Parents Through Surrogacy, 88 INDIANA L. J. 1187 (2013). MICHAEL T. COLATRELLA JR. MCGEORGE SCHOOL OF LAW 3200 FIFTH AVENUE. SACRAMENTO, CA 95817 (916)739.7303 (WORK) MCOLATRELLA@PACIFIC. 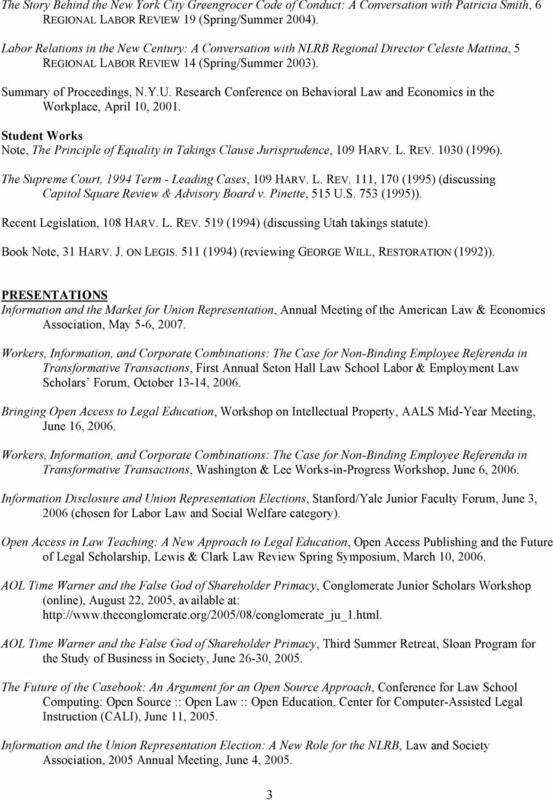 MODULES 2015 May 4 th 8 th First-Year Students Subject Time Classroom American Legal History Prof. James Kainen from 3pm to 5:30pm March 17 th only from 11am to 1:30pm Classroom 2.07 Comparative Law Prof.
CHERYL D. BLOCK Washington University Law School One Brookings Drive, Campus Box 1120 St. Louis, MO 63130 (314) 935-6444 cblock@wulaw.wustl. Karl S. Okamoto Earle Mack School of Law Drexel University 3320 Market Street, Suite 416 Philadelphia, PA 19104 (215) 571-4761 Karl.okamoto@drexel. JAYASHRI SRIKANTIAH Stanford Law School Crown Quadrangle 559 Nathan Abbott Way Stanford, CA 94305-8610 (650) 724 2442 jsrikantiah@law.stanford. LAURA ANN ROSENBURY Washington University School of Law Campus Box 1120 One Brookings Drive St. Louis, MO 63130 718-909-0173 (cell) lrosenbury@wustl.edu EMPLOYMENT Washington University Law School, St.